Hard to believe it’s been 20 years we’ve been walking up, and stumbling down, that long staircase… Every Friday and Saturday night, we’ve known there’s bound to be a selection of quality house music pumping out of the banging sound system, and a good crowd of like-minded souls. Whether it’s some local crew or an international legend, for two decades Geisha has been a reliable destination for a great night of music and dancing. To celebrate this monumental milestone, Geisha pulled out all the stops to put on a cracker of a night, bringing in house music heavyweights, legendary progressive pioneers Way Out West for a rare live set. And WOW was an appropriate acronym, as they had the place absolutely pumping with a barnstorming set. The duo, comprising of Nick Warren and Jody Wisternoff, released their self-titled debut in 1997. Ahead of its time with a lush, atmospheric, deep sound, it was a benchmark album. Both members are Perth, and Geisha, favourites, and have been here several times, but never together to play live, so it was quite a fitting booking. And the Geisha faithful knew this was set to be a special night, with it selling out in advance. If Way Out West wasn’t enough, they’d also got in highly regarded Dutch producer and composer Eelke Kleijn for a DJ set, another drawcard in itself. And he proved why, with a brilliant support set, of solid, driving tunes. The party vibes were high early on, with everyone wanting to make this night a special one, and celebrate the many that had come before. 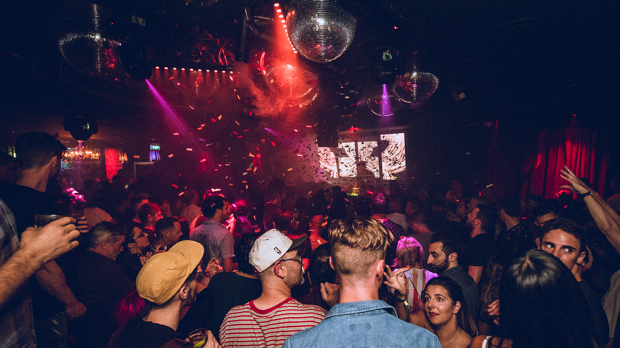 To assist in the merry-making atmosphere, a confetti cannon was in action during the night, periodically causing multi-coloured snowstorms over the dancefloor. Geisha has really honed its club experience over the years – it’s not over the top, but it’s got all the elements balanced just right – the small, intimate size, the amount of lighting, discoballs, the visuals, the DJ booth, the dancefloor focused soundsystem, the safe, welcoming atmosphere – to provide a real proper, world class, nightclub experience, one focused on the music and the DJ. And by doing this it has attracted a dedicated following of dance disciples, often a more mature crowd of discerning music lovers, there to dance – this is part of what gives the club its great vibe, having its priorities right. 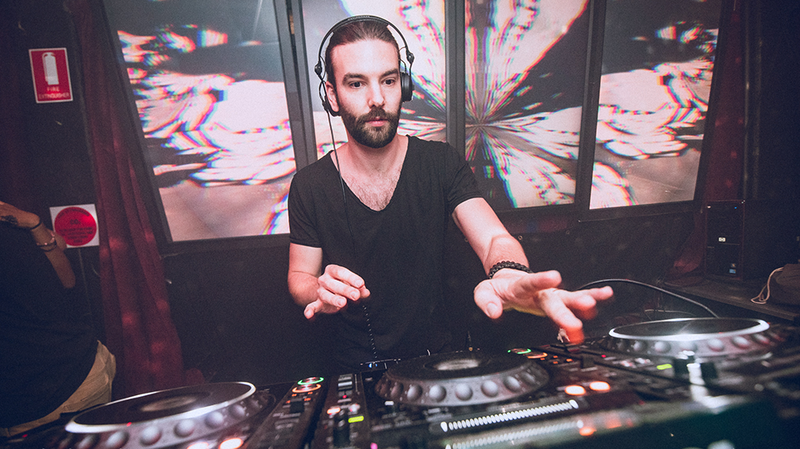 And as Kleijn built the mood splendidly, taking us past 1am, there was definitely an electric vibe in the air, as he dropped the awesome Dee Montero remix of Everything But The Girl’s Missing that is doing the rounds at the moment. 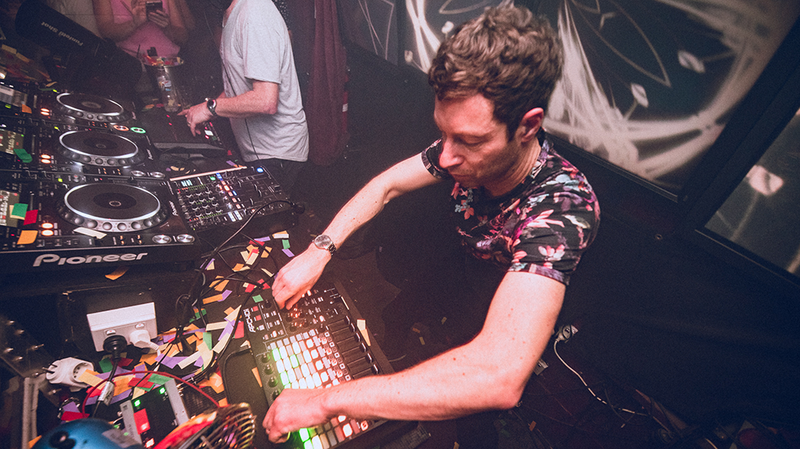 It was a superb and tasteful set of great tunes, deep driving bass and smooth mixing. He dropped several of his own immaculate productions including De Orde Van De Nacht and The Calling, as well some of his own remixes, like Piek’s Avalanche. The man needs to be brought back for his own headline set. In the live arrangement the duo work together to recreate their intricately produced arrangements. Warren was on live pads, triggering beats and samples, sometimes playing with drumsticks, while Wisternoff controlled things from behind the colourful array of buttons of his APC Abelton mixer. Live they have such a great full sound. Heavy beats, deep bass, perfectly balanced with some stunning melodic touches. And their back catalogue goes deep. Classic tracks sounded even better, and more dynamic, live. From the huge Slam and the blissful Running Away from their underrated album of 2017, Tuesday Maybe, to the Tangerine Dream sampling beauty of Everyday from 2004, before taking it back to ’97 for a fitting, soaring finale of the The Gift with its classic breakbeat and beautiful female vocal. It was absolute, non-stop, quality tunes, with the constant, marching beat keeping the dancefloor packed full all night, until Jimi J took over for the late shift, providing a good follow up of driving, deep progressive sounds, including a great remix of London Grammar’s Hey Now. Another set representative of the high standards Geisha has established with its dedication to developing new talent and world class residents. A superb night of music and a masterclass from a couple legends, and a rising new star, to fittingly celebrate 20 years dancing the night away at Perth’s home of house – one of the greatest and longest running clubs our city has ever seen, and it’s still going strong. Cheers Geisha, here’s to many more!